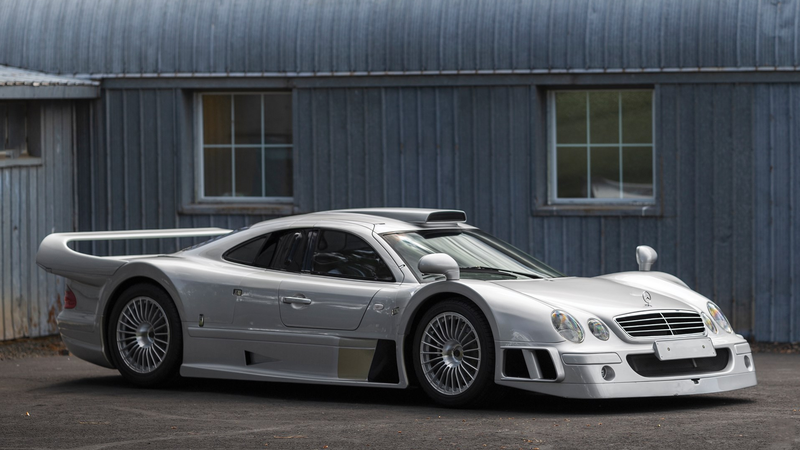 Out of all the racing-derived homologation cars to come out of the 1990s GT1 category, the Mercedes-Benz CLK GTR was one of the greatest and wildest. Only 25 of them were ever built—and one is headed to the upcoming Pebble Beach auctions. Of the 25 CLK GTRs that were built, 20 were coupes. This particular one is the ninth example. Everything on it is original: The body, engine and the drivetrain. It only has a hair under 900 miles on the clock. Designed with the visual cues of a standard Mercedes CLK, engineers gave the road-legal race car a 6.9-liter V12 engine with over 600 horsepower. And just look at it. Long and low, with a roof scoop and vents and holes cut everywhere into its body. The dramatic doors swing upwards. It’s an utterly rare and wonderful car, up there with Porsche 911 GT1 Straßenversion. And inside? It’s just another Mercedes-Benz CLK coupe! They wanted $1.5 million for this thing when it was new. The RM Sotheby’s listing now estimates that it could go for $4.3 million to $5.2 million. Check out site for more photos of it. And when you’re done with that, listen to how great it sounds. Start here.